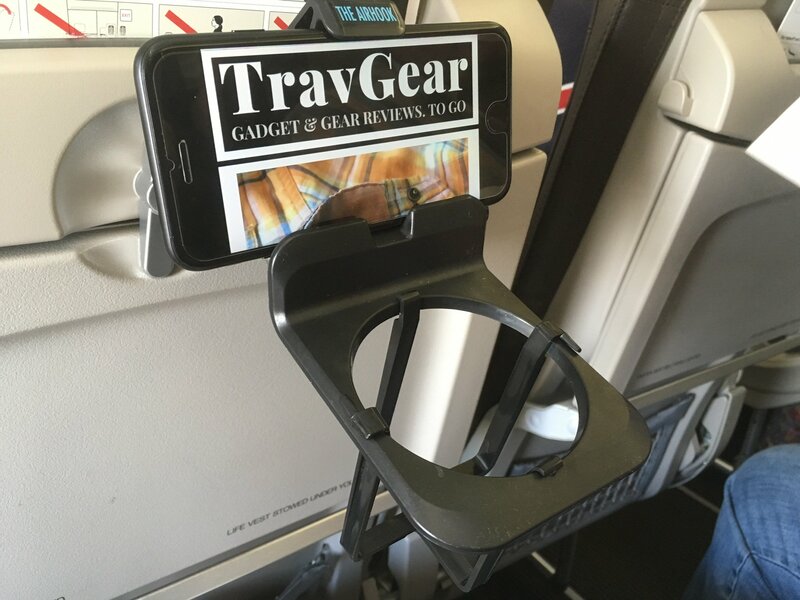 Are you tired of holding your phone while you watch a movie on a short-haul flight? Maybe you prop-up your phone on the tray table in front of you, but you’re sick of craning your neck down to watch video. Cue Airhook, an ingenious- sounding invention that attaches your phone to the seat-back in front of you, so that everything is eye-level. Compatible with both phones and tablets, Airhook adds both an integrated cupholder and a small hook for attaching earphones. Sounds too good to be true? Well, sadly that was exactly TravGear.com‘s experience on some recent short-haul flights around Europe. Set-up sounds simple; you unlock a tray table in front of you, place Airhook’s anchor over the top of the tray table, and then close and lock the tray table. You then put your phone or tablet into a groove on the top and pull a bungee up behind it to grip it at the top. Unfortunately, the groove you put your device appeared to be badly positioned when we tested Airhook; our device was pointing downwards, and any efforts to repoint it upwards towards our eyes meant the device falling out. Did the whole thing collapse at least once during the flight, leaving the phone on the floor? Twice, actually. The flexible yet brittle drinks attachment does not work. Unless you perfectly line-up four tiny nodules with their holes to fix the thing in place, it too easily falls out. Red wine all over your lap? No thanks. There is also the matter of having a large plastic device in front of you that you’re not used to having on a flight. Consequently, every time you move your body your arms you risk completely destroying the drinks attachment, and covering yourself in liquid. This is all too easy to do; getting up out of your seat become something of a gymnastic manoeuvre. As well as constantly battling disaster, there’s also the problem that the drinks attachment is useless with a bottle of water, which is perhaps the most common thing you would want to store while on a flight. Place it in the drinks attachment, and you will not be able to see your phone’s screen. To be fair, designing a universal gadget like this to suit every single design of seat-back on every kind of airline is a thankless task. On the packaging it does say that Airhook may not be compatible with all devices, cups, cans, bottles, or seats. And that’s the truth. Using a net instead of that dodgy drinks attachment is one way improvement that could be made, but the biggest problem is the swivel system. It just doesn’t go to the right angle; a dog clutch is needed here to lock it into place. There are just too many moving parts of Airhook, and the solution is actually pretty easy; get an engineer on-board to redesign it. It’s a nice idea but the Airhook needs a redesign, and probably the dumping of that drinks attachment. But we do hope it returns as Airhook 2.0 because with the Middle East gadget ban, devices such as this are more important than ever.